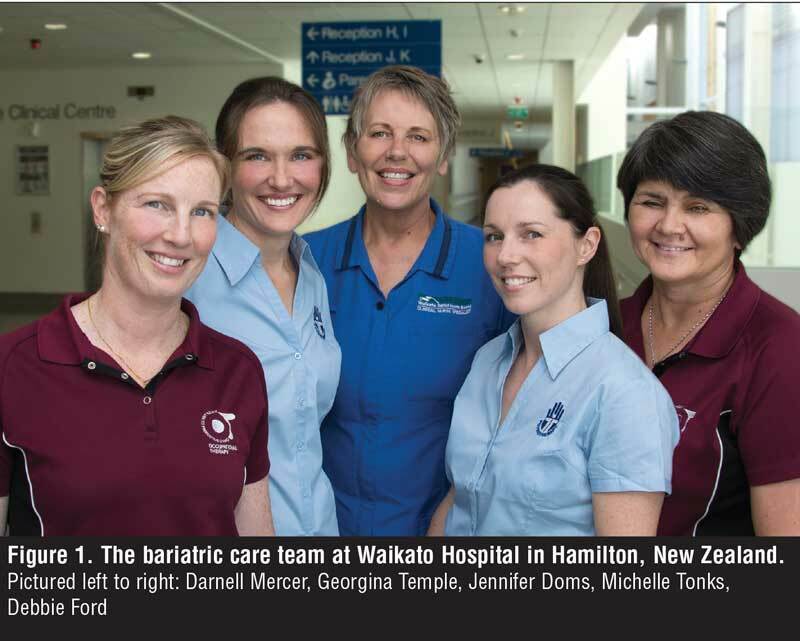 Georgina Temple, Jennifer Doms, Michelle Tonks, Darnell Mercer, and Debbie Ford are from Waikato Hospital, Hamilton, New Zealand. Susan Gallagher is from Celebration Institute, Inc, Houston, Texas. Abstract: Care for hospitalized individuals living with morbid obesity is considered more complex for a number of reasons. Authors suggest that adults with morbid obesity have more significant comorbid conditions as compared with their non-obese counterparts. Further, dignity, safety, and satisfaction are often threatened because of ill-thought-out care plans. In healthcare settings, these challenges often lead to increased humanistic, clinical, and economic costs. A case-study approach is used herein to explore the economic and clinical considerations of bariatric readiness, which includes preplanning and outcome measures. Facilities that offer weight loss surgery have comprehensive policies, procedures, training, and tools that serve as a framework for managing anticipated and unanticipated patient care needs. The Metabolic and Bariatric Surgery Accreditation and Quality Improvement Program (MBASQIP) promotes national accreditation standards for bariatric surgery centers. MBSAQIP and other groups require patient care support to be in place in order for healthcare facilities to receive accreditation status. [1,2] Programs that have achieved accreditation status in performing weight loss surgery have seen dramatic improvement in clinical outcomes. However, the nonsurgical individual with morbid obesity admitted to a facility without this accreditation might not have the benefits associated with this level of excellence. In the United States and globally, patients who have morbid obesity historically have had increases in their length of stay, costs of care, and adverse events, such as pressure injury, fall-related injury, infection, pneumonia, and embolic conditions. Many of these events are associated with the hazards of immobility. Authors have identified both economic and clinical implications in caring for the person living with morbid obesity. [5,6] Experts are seeking ways to ensure early and ongoing mobility as a way to combat the economic and clinical hazards of immobility. Bariatric readiness by way of criteria-based protocols might be one such strategy to address the consequences associated with immobility. A case study is featured herein that explores the economic and clinical impact associated with bariatric readiness. Specific clinical complexities of bariatric care are examined. Leading and lagging outcome indicators associated with bariatric care are described as well as the way factors such as dignity, safety, and satisfaction influence care. An interdisciplinary approach to patient care is presented as an important step to developing and supporting a pre-planning tool that can be part of the process for bariatric readiness. Dignity is at the heart of sound bariatric care; however, many patients report experiencing weight bias. Weight bias is a term that refers to devaluing a person solely based on excess body weight or weight maldistribution. Experts suggest that weight bias is considered one of the most complicated social phenomena, whether in the general population or in the healthcare setting. As early as 1995, Fox referred to this as the last safe domain of discrimination and prejudice in the United States. Puhl and Brownell explain that there is consistent evidence that individuals living with obesity experience discrimination in family, social, education, and employment settings. Further, studies suggest that healthcare professionals, including physicians, medical students, nurses, dietitians, and behavioral health professionals, share the same attitudes of obesity, weight bias, and discrimination as the general public. [11,12] These studies reveal that some healthcare professionals hold beliefs that patients with obesity lack self-control, are lazy, and have character flaws causing them to be nonadherent when making attempts to lose weight. Researchers have examined strategies to overcome these beliefs. Respect, dignity, and compassion toward the person who has morbid obesity requires execution of a well thought-out plan of care based on trust. This plan best serves all stakeholders when size-appropriate care and treatment, compassionate communication, and supportive language are in practice. Sensitivity education and training are good first steps in overcoming bias and changing attitudes. Criteria-based pre-planning tools that include size-appropriate technology and equipment are also needed. For instance, access to size appropriate furnishings, physical space, equipment, supplies, and instruments create reasonable accommodation. Having the right equipment at the right place and at the right time promotes efficiencies. In addition, the development of a team of experts who serve to support caregivers when questions of equipment, mobility, physical assessment, and care arise is essential to success. Kaminisky and Gadelenta explained that employees hesitate to interact with individuals whose size interferes with the caregiver’s ability to provide reasonable care or intervention. This important study suggests that when caregivers have resources necessary to perform tasks the extent of sensitivity toward the individual who has morbid obesity increases. Those areas in the Kaminisky and Gadelenta study that did not have access to necessary tools (e.g., equipment) and resources (e.g., support personnel) held weight bias to a greater extent. Drake et al present similar findings as they explain that having access to specialized equipment was significantly related to satisfaction for those working in in-patient facilities; over 97 percent of those who reported satisfying experiences also had access to specialized equipment. In contrast, 68 percent of those reporting an unsatisfactory experience did not have access to specialized equipment. A high degree of adiposity affects every cell, every organ, and every system of the body, as well as morbidity and mortality. In many cases, this in turn impacts the ability for healthcare providers to deliver equitable care. Standard healthcare policies and procedures might not serve the needs of the individual who has overweight, obesity, or morbid obesity. Studies suggest that the person with a high degree of adiposity will present with an average of 2.6 significant comorbid conditions, which might include cardiac disease (associated with left ventricular hypertrophy), hypertension, insulin resistance/diabetes, dyslipidemia, obesity hypoventilation syndrome (associated with right-sided heart failure), and more. As more acute care facilities struggle with prevention of the nonreimbursable events as described by Centers for Medical and Medicare (CMS), bariatric patient care continues to gain attention. For instance, nonreimbursement, penalties, fines, and claims associated with avoidable Stage 3 and 4 pressure injury or surgical site infection are two areas of concern. An individual with a high degree of adiposity is at greater risk for skin injury simply because of skin changes associated with increased adiposity. For instance, Chen et al explain that performing surgical procedures on individuals who have morbid obesity usually takes longer, the operating fields are deeper, the spaces in which an infection can develop are often greater, and blood flow in adipose tissue is less than in other types of tissue. Consequently, this can lead to slower healing and places the patient at risk for hematoma, surgical site infection, and/or increased length of stay. From a pressure injury perspective, Cai et al determined a significant increase in pressure injury development among patients with obesity compared to patients without obesity. Although specific analytics pertaining to cost associated with bariatric pressure injury do not exist, the costs of pressure injury among the patient population without obesity do exist. According to Berlowitz et al, medical management of pressure injuries cost the United States healthcare system $9.1 to $11.6 billion per year. Individual hospitals spend about $5 billion annually to treat pressure injuries. An acute hospital stay that involves pressure injury might incur additional charges of up to $700,000. Treatment costs for a Stage 3 pressure injury can range from $5,900 to $14,840; treatment of a Stage 4 might cost between $18,300 and $21,410. Falls can be another consequence of obesity. Mitchell et al indicated that there were 31 percent more falls among hospitalized individuals with obesity. This is thought to be related to reduced peripheral sensation, polypharmacy, generalized physical weakness, or instability when standing or walking. Patakay et al suggested that altered center of gravity associated with excess weight and weight maldistribution places the person with morbid obesity at risk for falls and, therefore, fall-related injury. The deconditioned individual is at even greater risk. Some authors believe the risk of falling and fall-related injury seems to be more related to dynamic, rather than static elements. [34,35] This could be explained by the fact that there is no real reason that people with obesity should encounter a balance disadvantage, as long as the center of gravity remains within the base of support, which is usually the case in a static situation. However, once the center of gravity falls outside of the base of support, recovering balance might become more difficult than for individuals without obesity because of the greater body weight to be moved. Patient-specific activity and mobility can be more challenging. In a study conducted by Rose et al, the average time to stand and walk a patient with morbid obesity was 99 minutes. Activities such as toileting, turning, and other patient care activities were significantly more time consuming. They contend the time-consuming nature of bariatric care can lead to staffing challenges. Each of these complexities are concerning, but collectively they serve to pose barriers to both economic and clinical efficiencies. In addition to the general health consequences associated with issues of excess weight and weight maldistribution, economic consequences exist, and these economic costs can be profound. For instance, in a meta-analysis that examined more than 60,000 admissions, there was increased ventilatory time and increased intensive care unity (ICU) length of stay among patients with a body mass index (BMI) greater than 30kg/m2. When pressure injury occurs, the costs are compounded because of generalized tissue injury and time to heal. The same is true among individuals who sustain fall-related injury, pneumonia, or embolic conditions. [40,41] The length of stay in the general and acute care hospital can be prolonged and therefore costlier. According to the McKinsey Global Institute, the global economic impact from obesity in 2014 was approximated at the equivalent of $2.0 trillion, or 2.8 percent of global Gross Domestic Product (GDP)—roughly equivalent to the global impact from smoking or armed violence, war, and terrorism. The United States spends an estimated $240 billion annually on obesity-related healthcare expenses, which include direct costs, such as outpatient and inpatient health services and drug therapy. Researchers from The University of Auckland announced the results of a 2012 study based on 2006 economic data, showing that costs associated with overweight and obesity in New Zealand range between $722 million and $849 million (NZD) a year in healthcare costs and lost productivity. Other countries find a similar economic burden. This economic burden is acting as catalyst to a global awareness that individuals, communities, states, nations, and international organizations have an opportunity to better understand the complexities of excess weight and weight maldistribution. As groups are seeking ways to meet these challenges, many are recognizing that progressive change often begins with a single successful idea or practice that supports a specific process. This idea or practice transforms into a facility, system, national or global best-practice model. This has happened in the United States in areas such as child abduction (Amber’s Law), newborn surrender (Safe Haven Law), and public access to sexual offenders’ registration (Megan’s Law). This case study features an example of care of bariatric patient care that incorporated a bariatric care team (BCT [Figure 1]). This innovative idea/practice served as a first step toward a generalized facility-wide best practice model for care of the individual with morbid obesity. The patient was a Samoan Maori man who was 29 years old and weighed 320 kg. He lived in Hamilton, New Zealand with his parents and was independently mobile in his home up to 60 feet, and even though he didn’t use mobility aids at home he did use stationary furniture to assist in mobility. At time of presentation, he had type 2 diabetes mellitus (T2DM). In May 2015, he was admitted into Waikato Hospital, Hamilton, New Zealand, with a diagnosis of lower leg cellulitis and sepsis associated with Group A streptococcus. His admitting blood pressure was 115/65. He was further diagnosed with rhabdomyolysis, which was thought to be related to laying on the floor before transport to the acute care facility. His immediate treatment included invasive monitoring, local wound treatment, intravenous (IV) fluids, diuretic, and antibiotics. On Day 4, he had developed friction-related blisters on his shoulder and hip. At the time of the patient’s first admission, the BCT had not yet been put in place. In-bed repositioning, sitting, standing, and walking were performed per policy; however, the frequency of mobility and activity was a nurse-driven decision. Like many organizations, a plan for addressing the need for additional training or handling equipment was not in place. Neither was criteria to access additional training or equipment, especially size-appropriate equipment. Mobilization was not attempted until Day 8 at which time it was assessed the bed was too high for safe egress, so the physiotherapist facilitated the provision of a floor based lift/hoist to aid the patient. Delays in access to mobility equipment, combined with the transfer of care from the high dependency unit to a ward environment resulted in a delay in the first lift/transfer from bed-to-chair, which did not occur until Day 15. He was deemed medically ready for discharge on Day 21 but required an additional 58 days in an in-patient rehabilitation unit to overcome physical deconditioning and immobility. He was discharged home on Day 79. In December 2016, the patient was admitted for a second time. Like many individuals who have endured a prolonged hospitalization, he delayed admission as long as possible. Subsequently, when he was admitted on December 11, 2016, he was much sicker and required far more intense intervention as compared to the May 2015 admission. He was admitted with left lower leg cellulitis, severe septic shock with a blood pressure reading at 60/40, and multisystem failure. Treatment included IV fluid administration, intravenous immunoglobulin (IVIM), and several IV antibiotics. Noradrenalin (norepinephrine) was given for hypotension and shock. Invasive renal support was provided by way of continuous veno-venous hemofiltration, which is a short-term treatment for patients in the intensive care unit (ICU) with kidney dysfunction accompanied by low blood pressure and who are too unstable for standard dialysis therapy. Even though the BCT was in its infancy, team members became involved with the patient’s care. The team recognized that his weight and general deconditioning precluded the use of standard hospital procedures. The BCT was contacted to address his mobility as this had been the factor in the extended admission the previous year. On Day 1, the physiotherapist performed a comprehensive evaluation. The evaluation determined that the critical nature of the patient’s condition prevented even the most basic mobility or activity. On Day 3, it was decided that his condition would allow in-bed activities/exercises, such as passive range of motion and frequent repositioning. An assessment was performed that matched his mobility needs with size- and weight-appropriate handling equipment, such as a walker, bedside commode, and floor-based lift and transfer system. On Day 4, the equipment arrived. Using the equipment, he was able to stand away from the bed, walk 90 feet with a walker, and shower with assistance. Both the nurse and patient agreed that without this specially designed equipment, mobility was unachievable. On Day 5, he was transferred from ICU to the general medical ward where mobility activities continued several times a day. Although he was admitted in far more serious condition, he was discharged home on Day 11. This trend toward early progressive mobility has emerged as a strategy to reduce ICU length of stay, general hospital length of stay, and immobility-related consequences of care among patients without obesity. However, large studies have not been done to determine if this approach, and the approach of the BCT herein, have an impact on the care of individuals with morbid obesity. Despite the outcome described in thhis case study, it is important to note that this the case of a single patient case study and does not necessarily prove that all of the success associated with size-appropriate progressive mobility can be attributed to the BCT. Yet, this study suggests there may be a role for pre-planning when addressing complex patients whose weight interferes with delivery of standard practice. Many of the complexities of bariatric care are left unaddressed because of misunderstandings in terms of clinical differences. Preplanning for care serves to manage common comorbid conditions as well as expedite early and ongoing mobility. 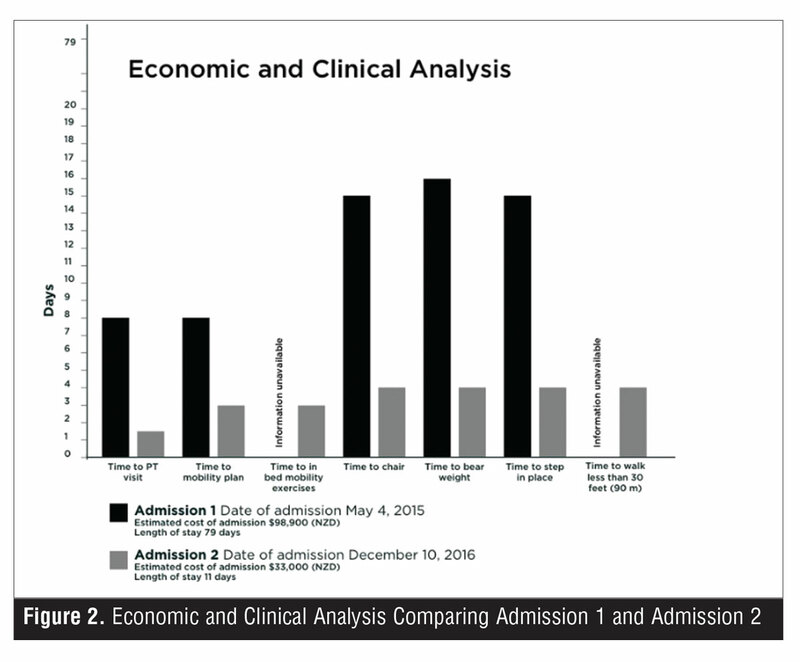 Both lead to measurable improvement in economic and clinical outcomes (Figure 2). Preplanning for equipment has been thought to be the first step for intervention. Although this is an important step, it is simply not enough on its own. A comprehensive, interprofessional clinical approach is necessary and should include the following: 1) bariatric task force; 2) a criteria-based protocol, which includes preplanning for size-appropriate care and treatment, including equipment; 3) competencies/skill sets; and 4) outcome measurement efforts. A criteria-based protocol is simply a preplanning tool based on specifically designated criteria. This protocol could replicate the processes put in place at the time of the patient’s second admission in the case study described. These criteria can include the patient’s weight, BMI, body width, mobility level, and/or clinical condition. Actual weight is an important consideration as it pertains to equipment; if the weight limit for equipment is exceeded, then breakage, failure to function properly, or patient/worker injury can occur. Body width is another consideration and is described as the patient’s body at its widest point, which could be at the patient’s hips, shoulders, or across the belly when side-lying. If the abdominal panniculus displaces the feet and legs laterally, the feet may be the widest point of reference. A third criteria could include the patient’s unique clinical condition or any clinical condition that interferes with mobility, such as pain, sedation, fear, or resistance to participate in care. Criteria-based protocols should be designed to meet the needs of the patient by ensuring access to resources, such as special equipment and clinical experts. As part of a preplanning tool, this can be accomplished in a timely, cost-effective manner. Part of the preplanning effort must include provision for communication. Although sometimes difficult to arrange, a face-to-face interprofessional team conference planned within 24 hours of admission might prevent costly economic and clinical consequences later. Consider including the patient and/or his or her significant other, as this offers insight into the patient’s special needs and expectations. Documentation of meetings, individual patient care goals, and corresponding interventions improves consistency and accountability. This level of accountability more fully defines each clinician’s responsibilities as well as commitments made by the patient and/or family members. Education provided to ensure basic skills or competencies is imperative and has become a critical part of any care plan. Consider having a process in place to identify learning needs. For instance, conducting a survey to determine the actual learning needs of clinicians might serve this goal. The value of a diverse, interprofessional team is that it provides a pool of experts to develop education and training. For example, suppose clinicians are seeking information pertaining to sensitivity. A social worker, chaplain, nurse expert, and patient member could develop a module to facilitate this education and training. Outcomes studies are essential to ensure long-term success and support. Economic and clinical data can be collected to measure the value of this organizational improvement effort. These studies should monitor both leading and lagging indicators. Economic and clinical outcomes are increasingly important as a result of pressure to achieve excellence status, as part of state or national mandates, or accreditation. An outcome indicator is considered information that can be used to predict and understand trends based on data. Two major categories of outcome indicators exist: leading and lagging indicators. The differences between these classifications of indicators rest in the predictions they make. The importance of a lagging indicator is its ability to confirm that a pattern has occurred. Reduction of immobility-related consequences of care is one of the most common outcome indicators used to measure a bariatric effort. For example, a decrease in the frequency and severity of pressure injury is thought to signify safe, quality bariatric care. Conversely, if the frequency or severity of pressure injury increases, this assumedly suggests quality bariatric care is deteriorating. Although lagging indicators are used to build performance dashboards and are often reported internally and elsewhere, they might not provide all the data necessary to craft a dynamic program. Leading outcome indicators signal future events. Leading indicators are often overlooked in a world where dashboards and economically driven outcomes are the measurements of choice. Leading outcomes indicators were once referred to as process outcomes. Process outcomes measured those activities that supported the overarching clinical, cost, or satisfaction outcome. A leading indicator might be numbers of individuals who have had sensitivity training or who are competent in using size-appropriate bariatric handling and mobility equipment. Time from admission to equipment availability or time from admission to assessment by the BCT are both leading indicators that are designed to impact lagging indicators. These leading indicators predict future events, which can be measured using lagging indicators. Both of these complementary outcome measures are essential in monitoring success over time. Execution of the BCT at Waikato Hospital was associated with improving both leading and lagging indicators in the case study discussed. Ms. Temple identified a need to capture these care challenges formally, collect specific data on bariatric hospital admissions, and develop a human resource for staff members to consult. In collaboration with Ms. Doms, a project was developed to trial the role of a BCT. The team would assess individual patient needs, monitor their pathway, and facilitate optimum patient care utilizing current hospital resources. The aim of the project was to identify systems and resources needed to improve the safety and quality of care provided to larger patients. Key clinicians with experience in bariatric care were approached to support and join the project. Debbie Ford, occupational therapist, Darnell Mercer, occupational therapist, and Michelle Tonks, physiotherapist, were members of the initial BCT. Allied Health Professional Lead (Lesley Thornley) provided supervision, but ultimately the group was self-established with no organizational mandate, and all work was completed in addition to current clinical roles. Executive interest in the bariaric care team was generated by the team sharing successes associated with the BCT with hospital governance committees and quality forums. In 2017, the BCT began the process for executive sponsorship. Once the BCT is formally recognized and has executive sponsorship, the next step will be to develop organizational level systems and resources to support staff members that includes a bariatric management plan; training packages; equipment management, such as labeling, purchasing, and rental packages; and further measurement of both leading and lagging outcome indicators. Although every facility will have a different structure within their unique organization, the key is to use models that have been successful. For instance, a BCT is to use a process for access similar to access to other resources, such as the wound care team, IV access team, and others. In the emerging Waikato model, criteria are being developed and will likely follow other clinical specialty resources. 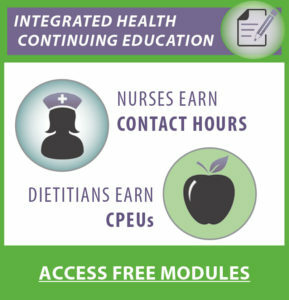 The goal for the BCT is to become a resource within the acute care facility that facilitates, in a timely manner, training and equipment in order to support the principles of early progressive mobility among individuals with morbid obesity or among individuals whose weight interferes with standard mobility tasks. Standard healthcare policies and procedures might not serve the needs of the individual who is living with morbid obesity, as was observed during first hospitalization in the case study patient. Although this patient’s only comorbid condition was type 2 diabetes, economic and clinical costs were significant. The BCT recognized opportunities to address these from the perspective of a single patient; however, the team created a framework from which to apply these economic and clinical benefits from a much broader point of view. The value of a BCT as the initial phase of planning and executing bariatric care cannot be overlooked. The BCT at Waikato Hospital functioned as an interprofessional quality improvement effort comprised of interested and diverse parties from several specialties. Like many bariatric teams across the country that address weight loss surgery or the general care for patients with morbid obesity, the team was designed to address ongoing issues and ideas. Although the BCT featured herein was comprised of therapy and nursing disciplines, a team could also include the pharmacist, physician, wound care expert, and others. The inclusion of a patient representative is essential in that he or she understands the lived experience of being a larger, heavier patient. The BCT and the executive sponsors at Waikato Hospital believe that a coordinated approach was key to identifying the case study patient’s complex size specific needs early, prioritizing his mobilization, and accessing the appropriate equipment as soon as possible in order to facilitate this. This process was thought to be the reason his second hospital admission was 1/6 the length of his first admission (11 days compared with 79 days), despite the more serious nature of his condition. In the case presented, the BCT was successful in reducing the economic and clinical costs associated with the patient’s acute care experience because of the timely and appropriate strategies, and access to proper equipment. As global awareness of the significant costs associated with caring for larger, heavier patients increases, healthcare facilities around the world can learn from the BCT model at Waikato Hospital. A strong interprofessional team with interest and enthusiasm for safe, quality care can serve to improve economic and clinical efficiencies in such a way as to overcome barriers associated with caring for individuals living with morbid obesity. American Society of Metabolic and Bariatric Surgeons. Metabolic and Bariatric Surgery Accreditation and Quality Improvement Program. https://asmbs.org/about/mbsaqip. Accessed May 17, 2017. American College of Surgeons. America College of Surgeons and American Society for Metabolic and Bariatric Surgery Unify Accreditation Programs. http://bulletin.facs.org/2012/04/acs-and-asmbs-unify-bariatric-surgery-accreditation-programs/ Accessed May 17, 2017. American College of Surgeons. accredited bariatric surgery centers have fewer postoperative complications. http://bulletin.facs.org/2016/09/accredited-bariatric-surgery-centers-fewer-postoperative-complications/ Accessed May 17, 2017. Gallagher SM. Bariatric Safe Patient Handling: Quality and Safety for the Patients of Size. Sarasota, FL: Visioning Publishers, Inc; 2015. Apovian CM: The clinical and economic consequences of obesity. Am J Manag Care. 2013; 19(10 Suppl):s219–228. Gallagher SM. Innovative methods to better manage clinical costs and humanistic aspects of bariatric care. Ostomy Wound Management. 2015;61(1):6–7. Nydahl P, Sricharoenchai T, Chandra S, et al. Safety of patient mobilization and rehabilitation in the intensive care unit: systematic review with meta-analysis. Ann Am Thorac. 2017;14(5):766-777. Puhl RM, King K. Weight discrimination and bullying. Best Pract Res Clin Endocrinol Metab. 2013;27(2):117–127. Puhl RM, Heuer CA. The stigma of obesity: a review and update. Obesity. 2009;17(5):941–964. Fox HR. Discrimination: alive and well in the United States. Obes Surg.1995;5:352. Camden SG, Brannan S, Davis P. Best practices for sensitive care and the obese patient: task report. Bariatr Nurs Surg Patient Care. 2008;3(3):189–196. Puhl RM, Luedicke J, Grilo CM. Obesity bias in training: attitudes, beliefs, and observations among advanced trainees in professional health disciplines. Obesity. 2014;22(4):1008–1015. Puhl R, Brownell KD. Bias, discrimination, and obesity. Obes Res. 2001;9(12):788–805. Gujral H, Tea C, Sheridan M. Evaluation of nurse’s attitudes toward adult patients of size. Surg Obes Relat Dis. 2011;7(4):536–540. Kaminsky J1, Gadaleta D. A study of discrimination within the medical community as viewed by obese patients. Obes Surg. 2002;12(1):14–18. Drake D, Baker G, Engleke MK, et al. Challenges in caring for the morbidly obese: differences by practice setting. Southern Online Journal of Nursing Research. 2008;8:3. http://www.resourcenter.net/images/SNRS/Files/SOJNR_articles2/Vol08Num03Art08.pdf. Accessed March 22, 2017. Gallagher SM. Exploring the relationship between obesity, patient safety, and caregiver injury. International Journal of Safe Patient Handling. 2011;1(2):8–12. Gallagher SM, Dawson JM. Charting a path forward: results and recommendations from ANA’s SPHM environmental scan. American Nurse Today. 2016:11(3):18–19. Gallagher SM. Bariatric Safe Patient Handling: Quality and Safety for the Patients of Size. Sarasota, FL: Visioning Publishers, Inc.; 2015. Gallagher SM. Recognizing trends in preventing caregiver injury, promoting patient safety, and caring for the larger heavier patient. Bariatric Times. 2009;6(2):20–25. Berrington de Gonzalez A, Hartge P, Cerhan JR, et al. Body-mass index and mortality among 1.46 million white adults. N Engl J Med. 2010;363(23):2211–2219. Bercault N, Boulain T, Kuteifan K, et. al. Obesity-related excess mortality rate in an adult intensive care unit: a risk-adjusted matched cohort study. Crit Care Med. 2004;32:998–1003. Gallagher SM. Pressure ulcers, CMS, and patients of size. Bariatric Times. 2008;5(12):8–13. Pokorny ME. Lead in: skin physiology and disease in the obese patient. Bariatr Nurs Surg Patient Care. 2008;3(2):125–128. Chen CL, Shore AD, Johns R, et al. The impact of obesity on breast surgery complications. Plast Reconstr Surg. 2011;128(5):395e–402e. Gallagher SM. Bariatric wound care. In Shah J and Fife C (eds). Wound Care Textbook. Austin TX: Best Publishing Company; 2017. Cai S, Rahman M, Intrator O. Obesity and pressure ulcers among nursing home residents. Med Care. 2013; 51(6): 478–486. Berlowitz D, VanDeusen Lukas C, Parker V, et al. Preventing pressure ulcers in hospitals: a tool for providing quality care. 2011. http://www.ahrq.gov/professionals/systems/hospital/pressureulcertoolkit/index.html. Accessed December 1, 2016. Touhy T, Jett K. Ebersole & Hess’ Toward Healthy Aging. St. Louis, MO: Elsevier/Mosby; 2012. Leaf Healthcare Inc. Financial Impact of Pressure Ulcers. 2014. http://www.leafhealthcare.com/resources.cfm Accessed December 1, 2016. Mitchell RJ1, Lord SR, Harvey LA, Close JC. Associations between obesity and overweight and fall risk, health status and quality of life in older people. Aust N Z J Public Health. 2014;38(1):13–18. Pataky Z, Armand S, Müller-Pinget S, et al. Effects of obesity on functional capacity. Obesity. 2014;22: 56–62. Finkelstein EA, Chen H, Prabhu M, et. al. The relationship between obesity and injuries among U.S. adults. Am J Health Promot. 2007;21:460–468. Greve J, Alonso A, Bordini AC, et al. Correlation between body mass index and postural balance. Clinics (Sao Paulo). 2007;62:717–720. Delextrat A, Matthew D, Cohen DD, et al. Effect of stride frequency on the energy cost of walking in obese teenagers. Hum Mov Sci. 2011;30:115–124. Rose MA, Drake D, Baker G, et al. Nurse staffing requirements for care of morbidly obese patients in the acute care setting. Bariatric Nursing and Surgical Patient Care. 2006; 1(2):115–121. Thompson D, Eldesberg J, Colditz G, et.al. Lifetime health and economic consequences of obesity. Arch Intern Med. 1999;159:2177–2183. Akinnusi ME, Pineda LA, El Solh AA. Effect of obesity on intensive care morbidity and mortality: a meta-analysis. Crit Care Med. 2008;36(1):151–158. Hawley PC, Hawley MP.. Difficulties in diagnosing pulmonary embolism in the obese patient: a literature review. Vasc Med. 2011;16:444–451. Stein PD, Beemath A, Olson RE. Obesity as a risk factor in venous thromboembolism. Am J Med. 2005;118:978–980. Hauck K, Hollingsworth B.. The impact of severe obesity on hospital length of stay. Med Care. 2010;48:335–340. Swinburn B. The cost of obesity. 2012. https://www.fmhs.auckland.ac.nz/en/faculty/about/news-and-events/news/2012/12/11/the-cost-of.html Accessed December 1, 2016. Jonny K. The Effects of government policies, economic forces, and globalization on worldwide obesity. Bariatric Times. 2015;12(4):8–10. Nydahl P, Sricharoenchai T, Chandra S, et al. Safety of patient mobilization and rehabilitation in the intensive care unit. Systematic review with meta-analysis. Ann Am Thorac Soc. 2017;14(5):766–777. Gallagher SM. Emerging data on the state of obesity. Ostomy Wound Management. 2016;62(1):2016. Gallagher SM. Skin and wound care among obese patients. In: Bryant A, Nix D. Acute and Chronic Wounds. St. Louis, MO: Mosby; 2015. Thomas SA, Lee-Fong LM. Maintaining dignity of patients with morbid obesity in the hospital setting. Bariatric Times. 2010;8(4):20–25. Orbe MP, King G: Negotiating the tension between policy and reality: exploring nurses’ communication about organizational wrongdoing. Health Commun. 2000;12 (1): 41–61. Debono D, Greenfield D, Black D, et.al. Achieving and resisting change: workarounds straddling and widening gaps in health care. In: Dickinson H, Mannion R. The Reform of Health Care. London: Palgrave Macmillan; 2012:177–192. Debono DS, Greenfield D, Travaglia JF, et. al. Nurses’ workarounds in acute healthcare settings: a scoping review. BMC Health Services Research. 2013. http://bmchealthservres.biomedcentral.com/articles/10.1186/1472-6963-13-175 Accessed May 17, 2017.